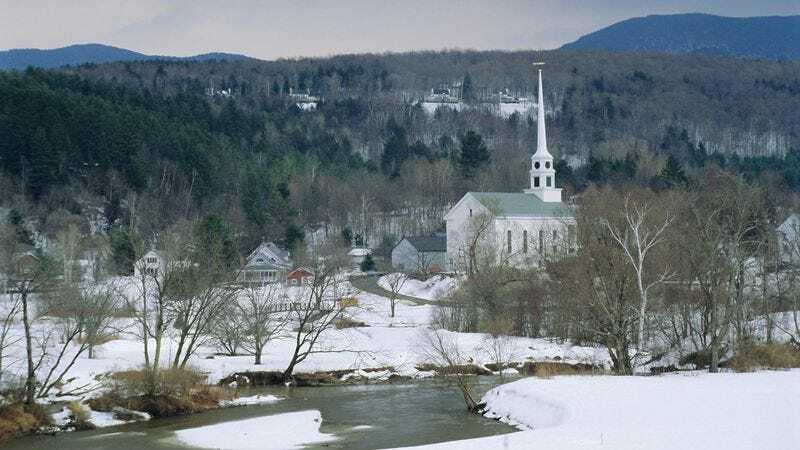 STABLETON, NH—After winding her way down an unmarked country road past several rolling hills and fast-flowing brooks, guidebook writer Kara Wellington reportedly emerged into a New England town Tuesday that was too charming to be gazed upon by human eyes. “My God, the rows of colonial homes with snow-laden eaves, the village green shaded by a stately sugar maple, the old stone inn lit by antique gas lamps—old-fashioned New England rusticity this potent must never be seen!” said Wellington as she shielded her eyes from the postcard-perfect white steeple of the town church, causing her to stumble backward into a bronze plaque commemorating something called the Ezra Wheeler Homestead, the overwhelming quaintness of which caused her to flee back to her car. “No one can ever know of the picturesque cobblestone main street or the darling penny candy shop that continues to operate as if untouched by time. No, a hamlet this idyllic mustn’t be written about, highlighted as a weekend getaway, or given a four-diamond award. Mankind was not meant to look upon such quiet, timeless splendor.” At press time, Wellington was terrified to realize that the only way out of town was through a most exquisite covered bridge dating back to 1831.